It’s been like forever since a child’s movie connected to its audience with so much heart. Usually they are animated with human acting animals, colored too brightly with annoyingly bouncy music. Based on the the 1977 movie of the same name, the live action story only resembles it by having a boy and his dragon. 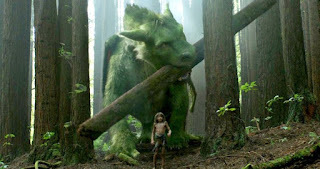 Director David Lowery wrote the script with Toby Halbrooks which opens the movie quietly with a narration regarding legends of dragons who live in the mountainous north of the small logging town of Mullhaven situated in some far northwester Pacific forest covered landscapes. (Which was filmed in New Zealand). Dark, green, thick with tall trees, a dragon could live there without anyone knowing. The story starts out tragically with Pete (Oakes Fegley) who at 5 years old was traveling on an adventure withis parents. An accident that is fortunately not shown, leaves the little boy on his own in the middle of nowhere with wolves surrounding him. Until there is a sound that scares even them. 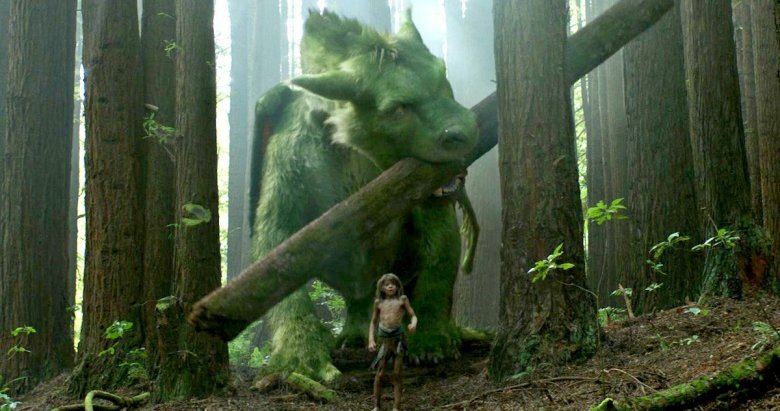 The first thing Pete asks if it’s going to eat him, but the large CGI dragon recognizes a kindred spirit in the little boy as he too has lost his family. Cut to six years later, Pete is running around the woods with his best friend and protector who needs Elliot from the book that survived the accident. He has thrived due to Elliot’s care, running around the forest with a freedom that kids of all ages have dreamed about at one time or other. One day he see’s forest ranger Grace (Bryce Dallas Howard) who sparks a memory of his Pete’s mother. He follows her to a logging camp that is perhaps illegally cutting too far into the woods. She loses her locket/compass that Pete picks up. Curiosity brings Pete back to watch the people in the logging camp, but the daughter of Grace’s boyfriend Jack (Wes Bentley) sees Pete and follows him. Then everyone starts to look for Natalie (Oona Laurence), who is slightly older than Pete who tells her that he’s 5, since that what his age was when he got orphaned.